One hazard of the work we do in an archives is the constant draw of some fascinating item. This photograph drew me right in and I was overwhelmed with the urge to learn more of this Wabash fellow who is so clearly enjoying himself. Meet Heman Powers of the Class of 1933. And yes, that is the correct spelling, Heman, not Herman. His nickname was Heme and he was a big man on this small campus. 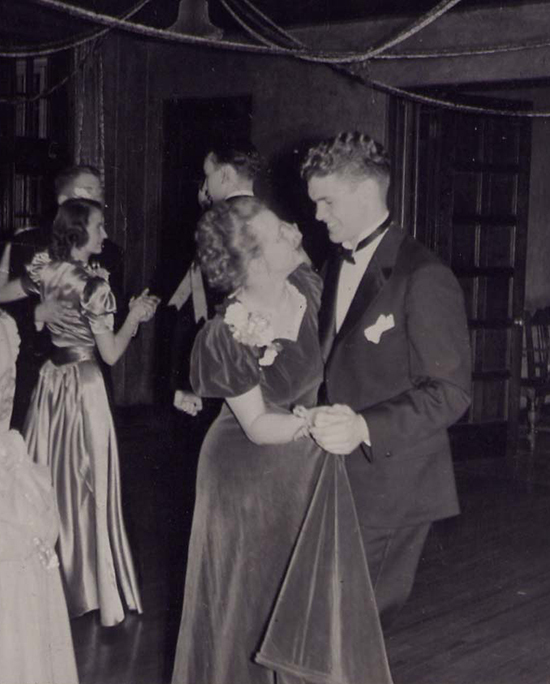 Heme as he was known to his fellow students was President of his fraternity, Phi Gamma Delta, a member of the Senior Council and a varsity football player of determination. 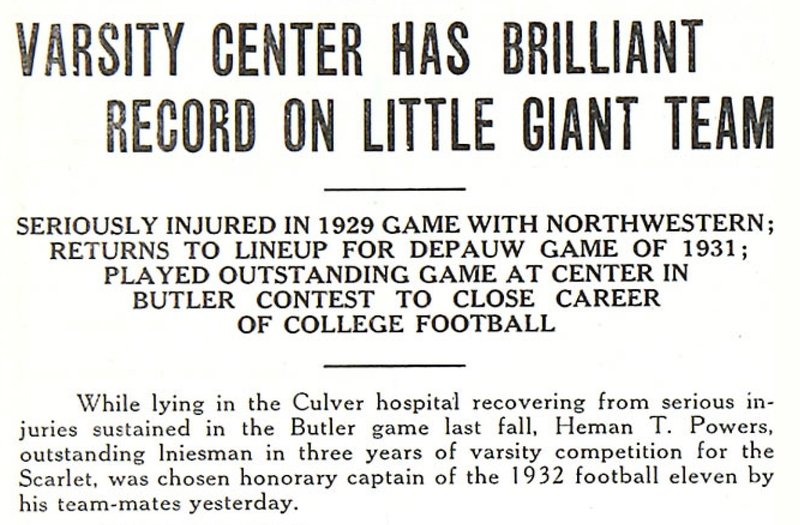 From The Bachelor of January 6, 1933, “Seldom is it that we find an athlete who so nearly typifies the Scarlet slogan, ‘Wabash Always Fights’ as does the man who was recently chosen as honorary captain of the 1932 Wabash football team….So seriously injured in his first year of varsity competition that it was not to be hoped that he would again be able to wear the Scarlet upon the field, he continued his fight, evidencing a spirit that is peculiarly Wabash’s own…and he came back gamely, still fighting for Wabash. “Again he was injured while personifying the slogan, ‘Wabash Always Fights’ and again he is fighting the good fight. Again he will win his battle for he has displayed that fortitude and spirit which has so markedly dominated his career as a Little Giant, that spirit always to be found in a true son of Wabash.” Indeed Heman did win his battle, but this second injury came at a tremendous personal cost. As a result of this injury, Powers ended up in the hospital in a long, painful and painfully slow recovery. In fact, he was in the hospital all winter, through the spring and into the summer. Here is another article on his injury and healing process. 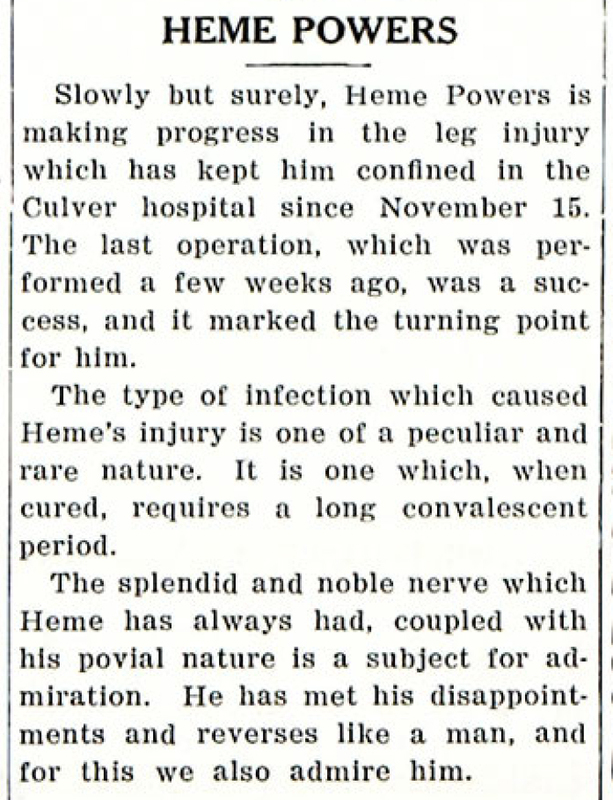 In total Heme had 27 operations and while this was surely hard to bear, as a result of this injury and the year and a half healing process, he did not graduate with his class. Never the less, he attended Northwestern night school, Harvard’s Business School Advanced Management Program and learned chemistry on his own, all while working full time. He became a chemical engineer through determination and hard work. But the one thing he did not have was his Wabash diploma and this bothered him. In 1940 Heme contacted Byron Trippet to ask about how he might complete his bachelor’s degree from Wabash. Arrangements were made for a program of reading followed by a series of examinations. This was possible since Heme had come so very close to finishing his Wabash courses. Life again intervened and before Heme had started this program, WWII began. With the extra duties and service required of those on the homefront, Heme was not able to execute his plan to fulfill the degree requirements. The war years came and went and it seemed as if Heme’s chance at a bachelor’s might have gone as well. But his fighting spirit alluded to above brought him back to Wabash again. In 1957 he applied once more to complete his bachelor’s via a focused reading program and completion of a supervised thesis. This time, the stars aligned and all was completed. In 1958 Heman Powers received his Bachelor of Arts degree and his diploma. A lifelong dream achieved, a triumph surely celebrated. Heme personified Wabash Always Fights and was a natural born leader. At each stage of his life he led – as President of his high school class, as President of his fraternity, as Captain of the football team, as President of the National Association of Wabash Men and President of the Chicago Alumni, and professionally as Executive Vice President of the National Aluminate Corporation. A leader with a determination to fight against the odds – a real Little Giant!